Free Shipping Included! KAF Home Frank Lloyd Wright Printed Dinner Napkin 20 x 20-inch 100-Percent Cotton Set of 4 (Oak Park) by KAF Home at Epfup. MPN: unknown. Hurry! Limited time offer. Offer valid only while supplies last. View More In Cloth Napkins. 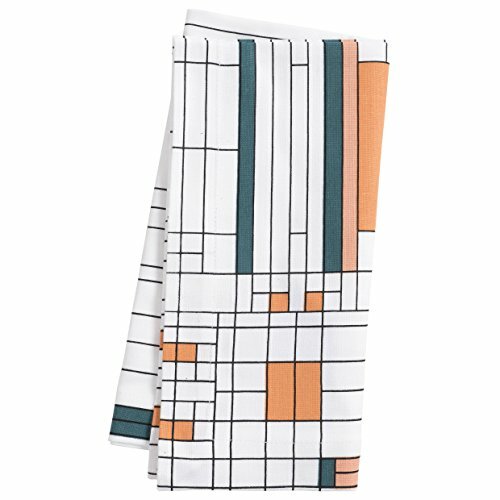 This 100% Cotton napkin has a beautiful and elegant printed design inspired by the work of iconic architect Frank Lloyd Wright. Soft to the touch and featuring mitered corners, this napkin will add elegance to any setting. This collection modernizes some of Frank Lloyd Wright's quintessential designs, bringing his celebrated compositions, and KAF Home's textile expertise, into today's home. Oak Park' is an iconic glass window design from a skylight at Wright's 1895 Oak Park Home and Studio. A portion of the sales of this product supports the conservation and education programs of the Frank Lloyd Wright Foundation. Contents: Set of 4 Cotton Napkins (20 x 20-inch). Machine wash cold with like colors. Dry promptly. Iron safe. Minimal shrinkage may occur. If you have any questions about this product by KAF Home, contact us by completing and submitting the form below. If you are looking for a specif part number, please include it with your message.